One of these cute wagons drove past me today. It was white, very original and very cool. If you have one of these beautiful Corolla's in the garage, or barn, it's a great time to be cruising in it. 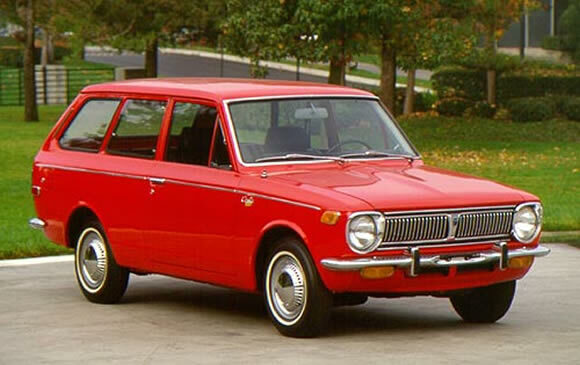 The Corolla was introduced into the US in 1968 and was the smallest car Toyota had sold in America up until that time. With a 60-horsepower, 1.1 liter four it wasn't going to rock your socks off but Toyota made high quality cars no matter what the size so they sold very well. Beautiful car. I owned a '69 wagon. Awesome 1st car. Cheap on gas with a 1.1 liter--it was actually 1066cc or 65cid, a KC engine. This appears to be a late '69 or 70 model with the 3KC which was 1.2 liter, or 1200cc. I had the early '69 model. The yellow front fender reflectors were thin as opposed to the wider ones shown. Also, behind the last window, there was not an air vent; these were added to the later model. Though the car has been gone for many years, it had over 331000 miles on it before someone crashed into me and totalled the car. I still have the key, hubcaps, owners manual, etc.--I just couldn't let it go!! Nice to see one in good shape, mine was blue. Great story anonymous. Thank you. Always good to hear about the cars people love(d) when they see a car that reminds them of it.